One of the things that I have learned early on in this journey of motherhood was to trust my gut. Granted I've only been at this for 6 weeks but it's been a very long 6 weeks! Joking aside, this seems like one of those profound lessons that changes everything about you, down to the core. And my mom affirmed this, so you know it must be right!! Some of the most profound lessons have been incredibly simple and yet so life affirming. Life affirming in that I know I am doing the right thing, that part of motherhood is coming naturally, and that yes there is sometimes a right way to do something more often there is a right way for your child. My first lesson or rather confirmation of the mom gut came early in Ainsley's first few days. They were worried about her jaundice and wanted to continue doing these terrible heel prick tests. This was a lesson in trusting my gut because five days later and four terrible heel mutilations later, her jaundice was gone and she was fine. In my mind I knew she was fine. I was even annoyed that the doctor didn't want to look at her first because clearly she wasn't yellow but nope heel mutilation. My milk took forever to come in...6 days! 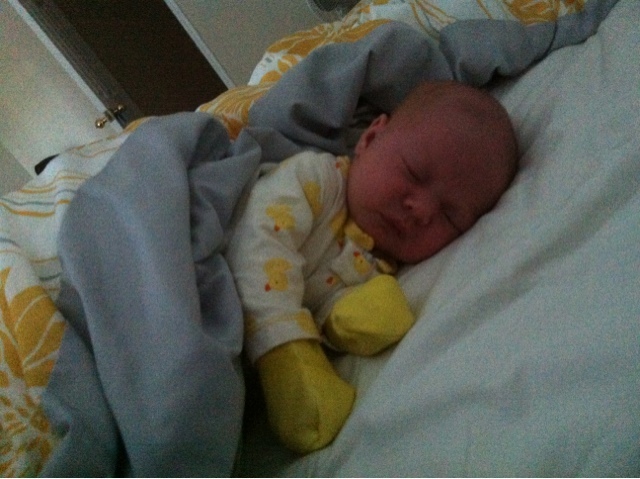 It came in on the 6th day so of course she was jaundice, she had nothing to flush out her system! But here's the lesson - I knew that she was ok but I let them test her again. I should have said no thank you! My second gut check lesson came about week two. It was a much easier learning process. I kept thinking that perhaps she wasn't warm enough at night and well, she wasn't. So my bundled up child now sleeps much better! She also has a pacifier which makes all the difference. That was another gut check moment too. I knew she needed it but couldn't bring myself to start it. My only non-lesson real triumphant moment came heading into 5 weeks. I had this feeling that she was just tired. So I conned my mother into helping me for the weekend while my husband was out of town and vowed to let ainsley sleep whenever she wanted and to catch up on her sleep. By the end of the weekend I had one happy baby! Thank goodness I paid attention to my gut. It's so interesting how so much of motherhood has to do with feeling and emotions and not much to do with science of logic. I don't consider myself in the left brain world much but i had prepared for Ainsley like a typical left brainer - lots of boom reading and planning. I've now managed to detox most of my brain and overcome the disabling inability to move from the conflicting things that I've read. I now trust my gut. Or at least I'm learning to. And in the process I'm learning so much more about myself. Below :: Ainsley hanging out with us in our bed...check out her layers! She's all bundled up and warm!